As a leading provider of powered and height adjustable baths for disabled bathers, Abacus Healthcare were proud to donate a Gemini bath to Matthew Cooper aged 12, as part of his family’s DIY SOS TV programme home conversion in Trench, Telford. Matthew was a typical active boy and Doctor Who fan until he was diagnosed with a brain tumour aged 10. Following surgery, he was given a positive prognosis however Matthew subsequently experienced two significant strokes resulting in paralysis. Supported by his parents Sue and Leigh, Matthew spent 18 months in Birmingham Children’s Hospital undergoing treatment and chemotherapy before discharge into rented accommodation. Matthew was unable to return to his family house as it was inaccessible for a wheelchair and impractical for his care needs. Hence the Cooper family desperately began to raise funds for the extensive building work required to get Matthew home. With the help of Matthew’s school, Wrockwardine Wood Junior School, they managed to raise over £52,000 and were on the brink of commissioning construction when DIY SOS contacted them. Matthew’s headmistress had written to the programme’s production company seeking help with a view to retaining donations for ongoing care and rehabilitation. ‘DIY SOS The Big Build’ is the flagship TV programme that provides extensive home conversions for families in need. The researchers met with the Coopers and agreed to deliver the project. The project would involve adaptations for wheelchair and hoist accessibility and a new single storey extension containing an interconnecting specialist bedroom and bathroom for Matthew. 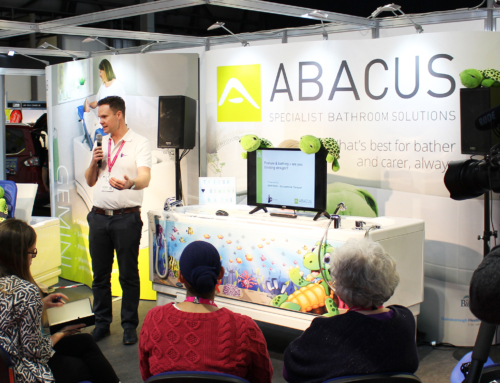 Abacus Healthcare was approached by DIY SOS regarding the donation of an accessible bath – this leading specialist immediately pledged assistance. Following appropriate assessments with an OT, a Gemini with variable height functionality and integrated changing, drying and bathing platform was deemed appropriate. During the build the Abacus fitters were able to install the Gemini bath at short notice and within a day so the overall challenging project deadline was not compromised. Following nine days of extensive remodelling of the Cooper’s house, driveway and garden, the family were invited back for the ‘reveal day’ which was attended by David Bertorelli and Brett Smith from Abacus. David and Brett were thanked by the Cooper family for the generous Abacus donation which helped Matthew return home. Despite needing specialist care 24/7 Matthew remains positive and is now able to enjoy more time with his family. When it is bath-time Matthew is lowered onto the Gemini’s platform and detachable postural support. The Gemini, containing temperature controlled water, is then raised so that Matthew can bathe without being physically lowered. Once Matthew is relaxed in the water, the bath can then be raised higher so his parents and carers can wash Matthew without bending over. This safe process ensures awkward transfers and manual lifting can be avoided along with the risk of back injury. Matthew also benefits from remaining warmer and more comfortable for longer as the changing and drying process is quicker.